The Griffin family watches TV together in their first appearance. The top image is from MacFarlane's hand-drawn pilot; the bottom image is from the completed episode. It was the first overall episode to be animated by Film Roman, Inc. and Sunwoo Digital International, through its animation division Grimsaem Animation Co. The basis for "Death Has a Shadow", as well as Family Guy a whole, was MacFarlane's thesis film The Life of Larry, created in 1995 while he was a student at the Rhode Island School of Design. A sequel was conceived in 1996 called Larry & Steve, which aired in 1997 as a segment of Cartoon Network's World Premiere Toons. Both shorts caught the attention of Fox, who contacted MacFarlane in 1998 to develop a series based on the films. A hand-drawn pilot was created by MacFarlane with a budget of $50,000, which led to the series being accepted for production and the pilot being remade and extended into its broadcast form. It was rated TV-PG-L (TV-14-L on Adult Swim). Critical responses to the episode were mostly positive. According to Nielsen ratings, it was viewed by 22 million viewers during its original airing in the United States. In the tenth season episode "Back to the Pilot", which premiered on November 13, 2011, Brian and Stewie go back in time to the events of "Death Has a Shadow". As Lois prepares dinner, Stewie puts the final touches on his mind-control device, only for it to be taken away from him by Lois, who won't allow 'toys' at the table. Later, Peter asks Lois for permission to attend an upcoming stag party. After he promises he won't drink, Lois lets him go. Unfortunately, Peter forgets his promise to Lois and plays such drinking games as "Drink the beer". He goes to work the next day with a hangover, and falls asleep on the job as a safety inspector in a toy factory. Peter misses dangerous objects such as a butcher knife, a surge protector, a gasoline can, razor blades, a porcupine, a toaster with forks inside and a plug in water. The company receives bad press after releasing unsafe toy products, and Peter is promptly fired by Mr. Weed. At dinner, Peter breaks the news to his children, but decides to keep it from Lois. He tries different jobs, such as cereal mascot and sneeze guard, but fails miserably. Brian pressures him to tell her the truth, but all he manages to do is to tell Lois how fat she is. Brian insists that Peter must look out for his family's welfare. With the word "welfare" in his mind, Peter soon applies for government assistance at a welfare office. But a processing error creates a weekly check for $150,000. Telling Lois he received a big raise, Peter spends his money on many foolish and extravagant things, such as renting the Statue of David, treating Meg to cosmetic surgery and even going so far as to surround his house with a moat to protect them from the Black Knight. Eventually, Lois receives the bad news and goes to court, still angry at Peter for lying to her in the first place. After Peter apologizes for lying to Lois and accepting the money instead of reporting the welfare error, the judge sentences him to 24 months in prison for welfare fraud. Lois, Brian, Chris and Meg exclaim, "Oh no!" but the Kool Aid Man bursts through the courthouse wall and exclaims, "Oh yeah!" Lois tries to explain he's not that bad and she loves him, and insists that, no matter what, she will always stand by her husband. The judge agrees, and sends her to jail with him. Stewie, being a baby, must have his parents by his side, regardless of his burning hate for them, especially Lois. He then whips out his mind control device and forces the judge into letting his father go free and get his job back. Peter states that he has learned his lesson and will never do it again. Instead he is going to try for such things as a minority scholarship, a sexual harassment suit, and a disability claim. MacFarlane initially conceived Family Guy in 1995 while studying animation under the Rhode Island School of Design (RISD). During college, he created his thesis film entitled The Life of Larry, which was later submitted by his professor at RISD to Hanna-Barbera, which led to MacFarlane being hired by the company. In 1996, MacFarlane created a sequel to The Life of Larry entitled Larry and Steve, which featured a middle-aged character named Larry and an intellectual dog, Steve. The short was broadcast in 1997 as one of Cartoon Network's World Premiere Toons. In 1997, while writing for Carol,[clarification needed] MacFarlane planned to develop the Larry shorts into a short film series for MADtv; however, the project was abandoned because the show did not possess a large enough budget to make any kind of animation. As development continued, the genre gradually shifted to a prime-time series, while the characters of Larry and Steve formed the basis for Peter and Brian, respectively. During the year, a Hanna-Barbera development executive introduced MacFarlane to alternative comedians Mike Darnell and Leslie Collins in an attempt to get Hanna-Barbera back into the prime-time business. The executives were unimpressed; a year later, MacFarlane contacted Collins at Fox; she arranged a meeting with him and the company executives to create a series based on the characters entitled Family Guy. Fox proposed MacFarlane complete a 15-minute short, and gave him a budget of $50,000. After the pilot aired, the series was greenlighted. Premises were drawn from several 1980s Saturday morning cartoons MacFarlane had watched as a child, such as The Fonz and the Happy Days Gang and Rubik, the Amazing Cube. 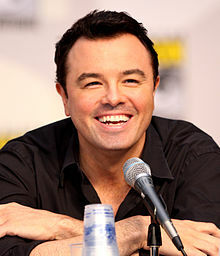 Family Guy creator Seth MacFarlane wrote the episode. I spent about six months with no sleep and no life, just drawing like crazy in my kitchen and doing this pilot. Upon completion of the pilot, the series went on the air. "Death Has a Shadow" was the first episode of Family Guy to be aired. It was written by creator MacFarlane, and was the first episode to be directed by Peter Shin. The episode guest starred Lori Alan as Diane Simmons, Carlos Alazraqui as Mr. Weed, Mike Henry as Cleveland Brown, Billy West, Fred Tatasciore, Joey Slotnick, Phil LaMarr, Wally Wingert, and fellow cartoonist Butch Hartman as various characters. The episode aired after Super Bowl XXXIII on January 31, 1999. For "Death Has a Shadow", several changes were made from the original pilot pitch. For the series, Lois was a redhead, as opposed to the original pilot, where she was a blonde. In the original pilot, Lois discovered that Peter lost his job, and by the end of the episode, he fails to get a new one nor does he apply for welfare. The idea for Peter to apply for welfare and unintentionally become wealthy was suggested by executive producer David Zuckerman, who suggested the idea in order to add a larger amount of plot to the episode. Several sequences and gags were integrated into the episode from creator MacFarlane's 1995 thesis film The Life of Larry, including the sequence where the Griffin family sees Philadelphia, and a brief cutaway where Peter farts for the first time at the age of 30. MacFarlane was cast as four of the show's main characters: Peter Griffin, Brian Griffin, Stewie Griffin, and Glenn Quagmire. MacFarlane chose to voice these characters himself, believing it would be easier to portray the voices he already envisioned than for someone else to attempt it. MacFarlane drew inspiration for the voice of Peter from a security guard he overheard talking while attending the Rhode Island School of Design. Stewie's voice was based on the voice of English actor Rex Harrison, especially his performance in the 1964 musical My Fair Lady. MacFarlane uses his regular speaking voice when playing Brian. The voice of Quagmire was inspired by fast-speaking radio advertising spokesmen from the 1950s. MacFarlane also provides voices for various other recurring and one-time characters, including news anchor Tom Tucker and Lois' father Carter Pewterschmidt. Alex Borstein was cast as Lois Griffin, Tricia Takanawa, Loretta Brown, and Lois' mother Barbara Pewterschmidt. Borstein was asked to provide a voice for the original pilot while she was working on MADtv. She had not met MacFarlane or seen any of his artwork and said it was "really sight unseen". At the time, Borstein performed in a stage show in Los Angeles, in which she played a redheaded mother whose voice she had based on one of her cousins. The voice was originally slower, but when MacFarlane heard it, he replied "Make it a little less [...] annoying...and speed it up, or every episode will last four hours". Seth Green was chosen to play Chris Griffin and Neil Goldman. Green stated that he did an impression of the "Buffalo Bill" character from the thriller film The Silence of the Lambs during his audition. His main inspiration for Chris' voice came from envisioning how "Buffalo Bill" would sound if he were speaking through a public address system at a McDonald's. Lacey Chabert was cast as Meg Griffin. Chabert voiced Meg Griffin for the first production season (15 episodes), but due to a contractual agreement was never credited. Chabert left the series because of time conflicts with schoolwork and her role on Party of Five, and was replaced by Mila Kunis. In the final scenes of the episode, the Griffin family is seen watching a television program called TV's Bloopers, a reference to the 1984 ABC and NBC television series TV's Bloopers and Practical Jokes. Towards the end of the courtroom scene, the Kool-Aid Man is seen breaking through a wall, which later became a running gag in the series involving a certain character or breaking through a wall and Peter's job as a Mascot is a parody of the Cocoa Puffs commercial. During Peter's recount of his job search to Brian, the talent show flashback mirrors the setting from The Sound of Music and makes a reference to the characters of the film, the von Trapp family. "Another surreal and imaginative running gag involves Peter’s attack of conscience. The devil on his shoulder instructs him to keep lying but when he turns to hear the angel’s perspective no one appears. We cut to the small angel stuck in traffic on the conscience’s highway. Later in the show the conscience arrives and Peter seeks his advice. So the small angel gets advice from the small devil on his shoulder and then turns to his other shoulder and again no angel appears. Cut to an even smaller angel stuck in traffic. Pretty memorable". The episode has received mostly positive reviews from television critics. In a 2008 review, Ahsan Haque of IGN rated the episode an 8.9/10, praising the integration of humor into the episode's storyline. Haque noted that the episode was "a very strong start to this long running classic series, and revisiting it serves as a reminder that unlike many other television shows, there are very few awkward moments, and much of the show's brilliance is immediately apparent." In 2009, the site singled out "Death Has a Shadow" as a "strong start [to Family Guy]". Robin Pierson of The TV Critic gave the episode a mixed review, rating the episode a 67/100, calling it one of the most densely packed pilots on television. He mentioned that it was entertaining but said that there were many jokes that followed the quality does not win out over quantity saying. He compared Peter to Homer Simpson and he compared the show to The Simpsons and King of the Hill. He criticized the amount of unfunny jokes while he praised the surreal moments. At the end of his review he stated that Family Guy was a different kind of animated comedy which set out to do jokes that other cartoons couldn't do, also mentioning that the show had promise to become really funny. A more negative review came from EW.com's Ken Tucker, who called the animation clunky, which he said made Hanna-Barbera's animation look like state-of-the-art. Tucker also said in his review that he hoped that smart people would use the Family Guy half-hour to turn off the television set and start a debate over the air strikes in Kosovo. He also called the show "The Simpsons as conceived by a singularly sophomoric mind that lacks any reference point beyond other TV shows". Even before it aired the pilot had received some criticism from the Parents Television Council, a watchdog; the creator of this website L. Brent Bozell III wrote that he initially speculated that Family Guy would be "pushing the envelope". ^ Plot synopsis information for the episode "Death Has a Shadow". Family Guy: Volume 1 (DVD). 20th Century Fox. 2003. ^ a b c Lenburg, Jeff (2006). Who's who in animated cartoons: an international guide to film & television's award-winning and legendary animators (Illustrated ed.). New York: Applause Theatre & Cinema Books. p. 221. ISBN 978-1-55783-671-7. ^ a b ""Family Guy" Seth MacFarlane to speak at Class Day: Creator and executive producer of 'Family Guy' will headline undergraduate celebration. Harvard Gazette. Retrieved 2007-12-21. ^ a b c d e P., Ken. "An Interview with Seth MacFarlane". IGN. Retrieved December 9, 2009. ^ a b c Barlett, James (March 12, 2007). "Seth MacFarlane – he's the "Family Guy"". The Great Reporter. Presswire Limited. Retrieved December 31, 2007. ^ Strike, Joe (February 13, 2007). "Cartoon Network Pilots Screened by ASIFA East at NYC's School of Visual Arts". Animation World Network. Retrieved October 18, 2009. ^ a b c Cruz, Gilbert (September 26, 2008). "Family Guy's Seth MacFarlane". Time. Retrieved August 28, 2009. ^ a b Weinraub, Bernard (2007-07-07). "The Young Guy Of 'Family Guy'; A 30-Year-Old's Cartoon Hit Makes An Unexpected Comeback". The New York Times. The New York Times Company. p. 2. Retrieved January 6, 2008. ^ a b c "Family Guy: Death Has a Shadow". Yahoo!. Archived from the original on 2011-06-15. Retrieved 2011-06-19. ^ "Lori Alan: Credits". TV Guide. Retrieved October 27, 2009. ^ "Phil LaMarr: Credits". TV Guide. Retrieved October 27, 2009. ^ a b c d MacFarlane, Seth (2003). Commentary for the episode "Death Has a Shadow". Family Guy: Volume 1 (DVD). 20th Century Fox. ^ a b c Zuckerman, David (2003). Commentary for the episode "Death Has a Shadow". Family Guy: Volume 1 (DVD). 20th Century Fox. ^ Borstein, Alex (2003). Commentary for the episode "Death Has a Shadow". Family Guy: Volume 1 (DVD). 20th Century Fox. ^ Graham, Jefferson (January 29, 1999). "Cartoonist MacFarlane funny guy of Fox's 'Family' Subversive voice of series is his". USA Today. p. E7. ^ Smith, Andy (2005-04-30). "A Real Family Reunion". Providence Journal TV. Archived from the original on 2010-09-22. Retrieved 2009-08-28. ^ Dean, Josh (2008-11-01). "Seth MacFarlane's $2 Billion Family Guy Empire". Fast Company. Retrieved 2012-06-19. ^ Franklin, Nancy (2006-01-16). "American Idiots". The New Yorker. ^ "Episode 9". The Graham Norton Show. Season 15. 2014-05-30. BBC. ^ a b c "Family Guy Cast and Details". TV Guide. Retrieved 2009-08-24. ^ a b c Miller, Kirk (2008-11-19). "Q&A: Alex Borstein". Metromix. Archived from the original on 2012-02-18. Retrieved 2009-08-28. ^ a b "Alex Borstein (Lois) Laughs at the Once-Dead Family Guy's Longevity". TV Guide. 2006-11-13. Retrieved 2009-08-24. ^ Graham, Jefferson (1999-04-09). "Seth Green fits right in with new Family". USA Today. ^ "Fans help 'Family Guy' return to Fox". Observer-Reporter. 2005-04-29. p. E5. ^ Green, Seth (2005-09-27). Stewie Griffin: The Untold Story: Audio Commentary (DVD). ^ Epstein, Daniel Robert. "Interview with Seth MacFarlane, creator of The Family Guy". UGO Networks. Archived from the original on 2008-12-18. Retrieved 2008-11-23. ^ De Leon, Kris (2007-09-25). "Mila Kunis Talks About Working on Family Guy and Her Upcoming Movie". BuddyTV. Retrieved 2009-09-03. ^ a b c d Pierson, Robin (August 7, 2009). "Episode 1: Death Has a Shadow". The TV Critic. Retrieved June 19, 2011. ^ Haque, Ashan (2008). "Family Guy Flashback: "Death Has a Shadow" Review". IGN. Retrieved September 14, 2009. ^ "7: Family Guy". IGN. October 14, 2009. Archived from the original on June 16, 2010. Retrieved January 24, 2009. ^ Bozell, L. Brent III (January 19, 1999). "WB: The Very Model of a Modern Network?". MediaResearch.org. Creators Syndicate. Archived from the original on June 8, 2011. Retrieved June 19, 2011.